iHerb Haul #10 – Skincare products & more! Here is my recent haul from the best online shopping site ever, iHerb!. 1) Andalou Naturals Lift & Firm Cream – You will find this product in one of my previous hauls. That time though, I had bought it for my brother. Recently he raved about it to me and so I had to get it for myself. 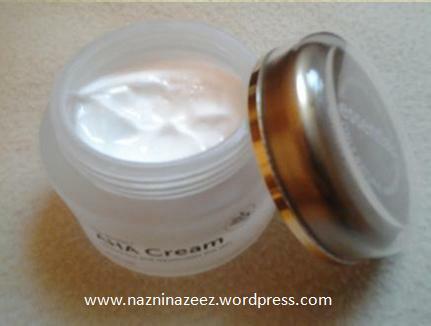 This cream has Hyaluronic Acid, DMAE and fruit stem cell complex (Apple / Grape). The main ingredient in it is certified organic Aloe Vera and also has Argan & Jojoba oils. This product is supposed to help with diminishing the appearance of fine lines & wrinkles, fade hyperpigmentation and improve overall texture for a visibly lifted, firmer complexion. I found it to be extremely hydrating and nourishing. It imparts a soft, supple feeling. It’s white in color, has a light Vanilla like scent and has a lovely, creamy texture. A little comes a long way. It’s meant to be used in the daytime. Though not shown here, I bought two of this, the other one a repeat purchase for bro. Price – $19.96 (Approx AED 73.32) for a tub containing 50 ml. 2) Andalou Naturals Night Repairing cream– Since I bought the day cream, I decided to check out the night cream too, as it’s a known fact that when you get products from the same range, it goes well together, works hand in hand and helps you achieve your goal in a lesser amount of time. This product contains certified organic Aloe Vera, Cacao butter, Hyaluronic Acid, Rosehip oil, Evening Primrose oil, Avocado oil and more. The Resveratrol & CoQ10 in it works as antioxidants, to stimulate circulation, slow cellular damage and speedy healthy cell renewal for improved skin texture. This cream has a balm like texture and is very light. It has a chocolatey smell, which I really liked. A little goes a long way with this product too. It sinks in really fast leaving skin looking healthy and slightly dewy. Price – $19.96 (Approx ) for a tub containing 50 ml. Based on my experience with both these products I would definitely recommend you the Andalou Naturalsbrand. Also, I preferred it because it is vegan, cruelty free, paraben free, sulphate free, Non- GMO & gluten free. When you use chemical free products, it really makes a wonderful difference in your skin. Both of these creams that I purchased are from their ‘Age Defying’ range and targets ‘Dry & Very Dry’ skin types. 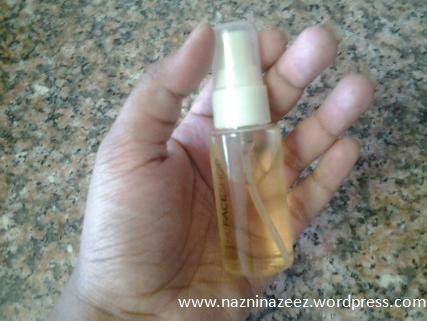 3) Avocado oil by Now Solutions– I love this oil so much since it’s multi purpose. I use it both as a nourishing face oil in my night time skin care routine and as a hydrating oil for my dry hair. This is a repeat purchase. Only difference though, is that last time, I had bought a smaller bottle (118 ml) while this time, it’s a larger one (473 ml). Price – $12.22 (Approx AED 44.89) for a bottle containing 473 ml. 4) Nubian Heritage Indian Hemp & Tamanu Deep Treatment Masque– Since I have dry hair, I wanted to try a product like this one. Funny enough, I don’t use it as a masque but as an overnight leave-in conditioner. The actual usage of it is to work it into damp hair from roots to end, cover hair with plastic cap for 45 mins and then to rinse off. However, I simply work it into my hair from the middle part until the very tips and leave it overnight. Next day when I wash my hair, it feels soft and manageable. It is white in color and has a thick texture. I first rub it in between both my hands, warm it up just a bit that way and massage it into the hair. This mask contains great ingredients such as Tamanu oil, Monoi oil, nutrient-rich Garlic extract and Bamboo to fortify hair. This is made for dry, textured and damaged hair. Overall, it’s a nice masque but not one I would urge you to buy because my expectations were really high for this product and it falls short of it. Price – $11.99 (Approx AED 44.04) for a tub containing 340 gms. 5) Hyaluronic Acid Firming Serum by Now Solutions– I was looking for a serum that hydrates well but doesn’t cost a lot. So, I chose this one. It’s supposed to naturally reduce appearance of fine lines. I love the runny texture of this product. A little goes a looong way. On application, it feels like my skin just drinks it up, leaving it hydrated. It has this extremely refreshing scent. It reminds me of the smell of the leaf of lemon tree. I would like to say this could be a cheaper version of Mad Hippie’s Exfoliating serum, which I have reviewed earlier. No doubt their ingredients are worlds apart but am comparing just the texture and feel of the products. I love any product that comes with a pump because it’s convenient and mess-free. So, I was delighted to see a pump on this one. However, I was surprised to see that there is no tube inside the bottle. On reading it’s back side, I understood that it uses an airless pump. So, you gotta shake the bottle, then pump to get rid of excess air and then product is dispensed out. If not, shake again. The base rises each time you pump. But I rather prefer a bottle with a pump/tube mechanism. But still, I love this product so much!. I HIGHLY recommend it!. Also, it’s paraben free, cruelty free and gluten free. Price – $11.04 (Approx AED 40.55) for a bottle containing 30 ml. 6) Badger Beard Balm – I got this for my brother since of late he is into grooming his beard. According to him, it’s a nice product and he would recommend it. It is a cruelty free product. Price – $14.39 (Approx AED 52.86) for a tin containing 56 gms. iHerb has introduced something new. A loyalty program!. After each purchase, 10% of your bill total (excluding shipping charges) is placed in your iHerb account. It has a validity of 60 days. Next time you purchase within this time frame, this amount is deducted from your bill total!. For this purchase of mine, I got $9.76 (Approx AED 35.85) :). Since Andalou Naturals was one of the ‘Brands of the Week’ at the time of my purchase, I got an extra 20% off it, thus saving $11.97 (Approx AED 43.97) on three products! The shipping via DHL was amazingly fast and it reached me from US to UAE in just 3 days. Gotta love how fast DHL’s service is. Shipping cost me $8 (Approx AED 29.38), since iHerb had a special offer running that month that no matter how much ever the weight is of the package, you can get it shipped for a flat rate of $8. There really is no other site that offers you so much value!. Use my code SCZ695 at checkout to get $5 off your first purchase! Skincare routine 101 (My night time skincare routine)! Different people follow different types of skincare routines, depending on what results they are looking for. Mine is an anti-aging routine. FYI : My skin type is normal, leaning towards dry (during winters). My routine is the same throughout the year. It doesn’t change according to seasons, except that in winter, I moisturize more often. I am about to turn 27 next month. I started following a basic skincare routine at the age of 23, which is the perfect age to start an anti-aging skincare routine if you are looking to ‘age gracefully’!. So, yes I have had a routine for 4 years now. 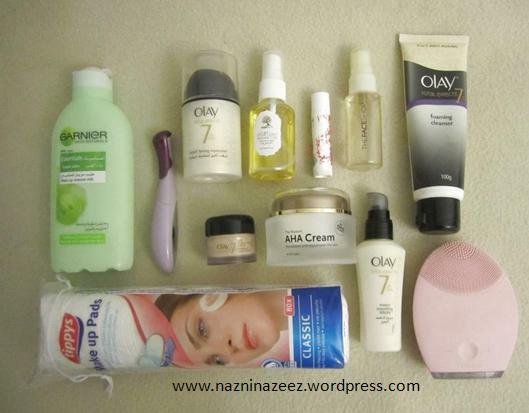 In the beginning, my routine was really basic with just two steps (Cleanse and moisturize). As you read ahead and see the steps below, you will see how much my routine has evolved over time. I kept adding more intensity and layers to the routine, until finally reaching one that I am very comfortable and pleased with. I give much importance to my night time routine because our skin renews itself while we sleep and giving it the right products at that time enhances skin’s ability to fight off all aging related battles that it fights. Also, I change up the products nearly every night so that my skin doesn’t get too used to the same set of products. If I mention every single product I use, in this post, we will be here all day!. 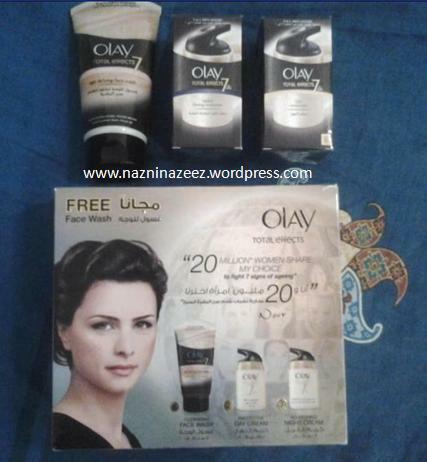 So, I will mainly cover the brand Olay, since that’s the brand that got me started on a routine. Here is the offer pack I bought for the first time: It is of great value – contains a night cream, a day cream and a daily face wash!. Back then, I bought it at around AED 88, if I remember it right. But over the years after that, I have bought it at various different prices, the latest being around AED 102. I bought it just to give it a trial. 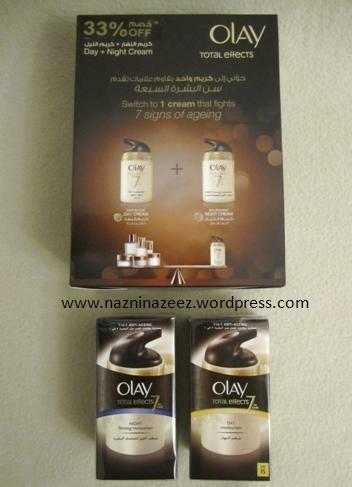 My skin looked MUCH better within a week of using the Olay Total Effects products. That got me hooked because any cream I had tried before that (like Fairever, Fair and Lovely, Vicco cream – all Indian brands!) didn’t work well with my skin even though I tried sticking a minimum of 2 – 3 months with each of these creams. Now four years later, I still am loyal to that brand and have lost count of how many products I have bought from them!. The Olay Total Effects range is perfect for those in their 20s. So, ready to learn how your skincare regimen should look like?. Let’s do this! You should never head to your bed with makeup on. It will clog your pores and suffocate your skin. Also, removing makeup gives you a clean surface to apply your skincare products on. 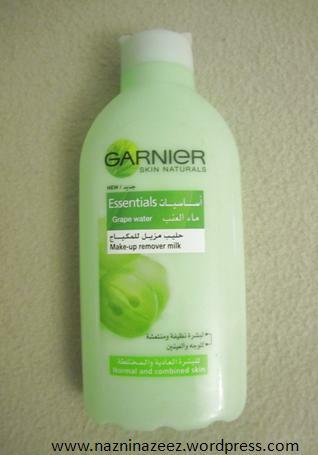 I am currently using Garnier’s Make-up Remover Milk, a stunning and gentle product that costs AED 13.95. I use Tippy’s cotton pads to apply it and then I wash my face. 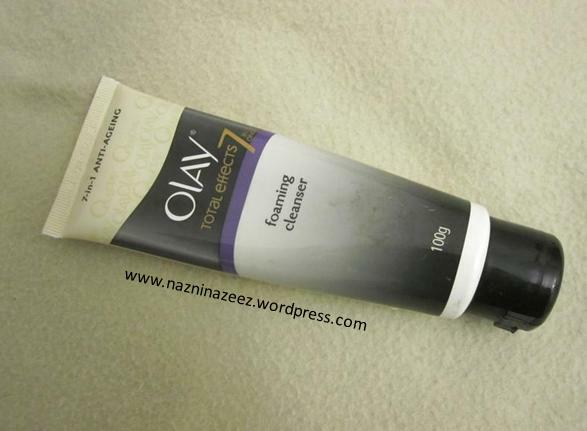 Next, I apply Olay Total Effects Foaming Cleanser to my wet face. It costs Rs. 225 (AED 13.59) for a tube containing 100gms. I bought this product in India. It’s not available in the UAE. Then I switch on my Foreo Luna and work it well on my face/neck. The first time I used this cleanser, I felt it made my face squeaky clean and left it dry. But when used with the Foreo, it’s absolutely great and gives an optimum cleansing experience. Once the Foreo beeps continuously three times, I set it aside and wash my face. Using a toner is important to keep your pores tight, remove impurities from them that the cleanser didn’t and to maintain the ph level of your skin. I use a DIY Apple Cider Vinegar toner. I spray it 5 times onto a cotton pad and gently go over my face/neck. Before ever using a skincare tool like Foreo, my cotton pads used to still show impurities like traces of foundation that my makeup remover and cleanser missed out!. But, now with Foreo in the picture, the cotton pad shows no traces of impurities!. I don’t wash my face after applying the toner, instead I go to the next step. Active ingredients in skincare are those ingredients that has the power to alter/affect the skin, like Retina A or AHAs. These kind of products should be in direct contact with cleaned skin. It shouldn’t be layered on top of other creams. I use the AHA Cream by Herbline Essentials for this step. It costs AED 342 for a tub containing 50gms. I gently massage it in upward circular motion until it’s completely absorbed. When applying on your neck start from the base of the neck and massage upwards. The gravity pulls our skin downwards as we age. So, you have to massage it in the opposite direction. Serum is a concentrated product that has the ability to penetrate into the deeper layers of your skin. It’s powerful and a must in your routine. 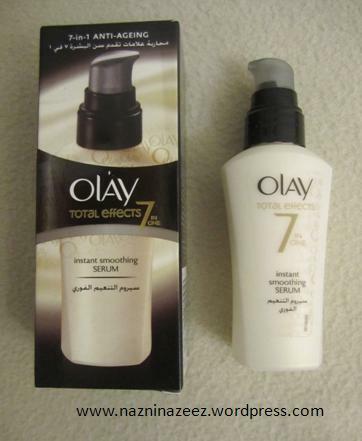 I use the Olay Total Effects Instant Smoothing Serum. It costs AED 53.50 for a bottle containing 50ml. I love it’s silky, light texture and pleasant smell. It gets easily absorbed into the skin. To apply it, take about 2 or 3 pumps of the product on your fingertips, rub the tips of both hands together and then gently press/dab the product on to your face/neck. Think of it like you are trying to push the product in rather than massaging it in. Your skin will feel hydrated and saturated with the product, when you apply it this way. I then use the anti aging side of the Foreo on the five areas prone to show fine lines first (forehead, both temples and both sides of your mouth) to help this amazing, anti-aging product work better. This is when you apply your favorite skincare oils. 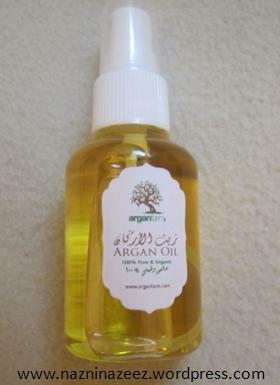 I am currently using the Arganfarm Argan oil. It costs $24.95 (AED 91.64) for a bottle containing 50ml. Oils are so great for the skin!. Though you might look a bit shiny when heading to the bed, trust me, there will be no shine when you wake up in the morning. To apply it, massage it in upward circular motion. Some people use skincare oils as their moisturizer. So, this becomes the final step of their routine. However, I like to go one more step. Before heading to that step (Step 9), I go ahead with Step 7 and 8, so that the oil has time to sit on my skin for a minute or so. 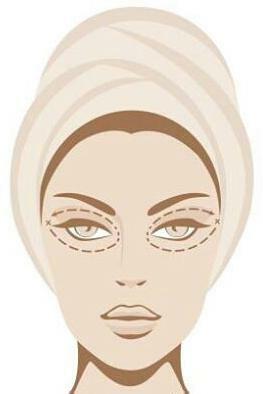 The delicate skin around the eyes need special care and thus everyone must have an eye cream. 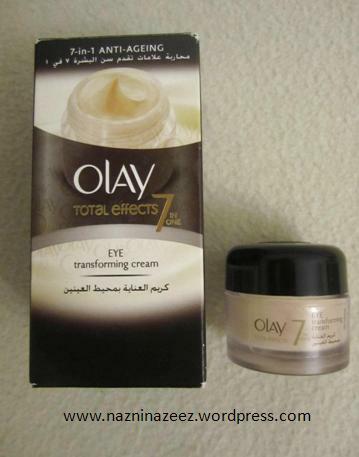 I am using the Olay Total Effects Eye Transforming Cream. It costs AED 53 for a container of 15ml. To apply it, dot it along the eye socket bone. Then slightly tap with your ring finger in a circular motion, starting from the outer corner of the eye to below the eye, then the inner corner of the eye and above the eye. The tapping motion should be fast, gentle and right on that bone surrounding the eye. At first, I didn’t know it’s correct application and used to apply even on the eyelids too!. That is so wrong. I use the Eye-o-sonic by Michael Todd’s True Organics to apply my eye cream. Lips are delicate just like the eye area. You need to moisturize them regularly. 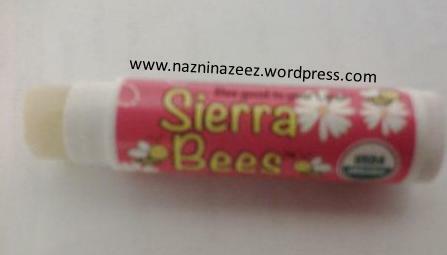 I currently am using Sierra Bees lip balm. It costs $0.50 (AED 1.84). The final step!. A moisturizer seals in whatever you applied before it and hydrates your skin. To apply, you can either tap it into the skin, using only your fingertips or massage, in upward circular motion. 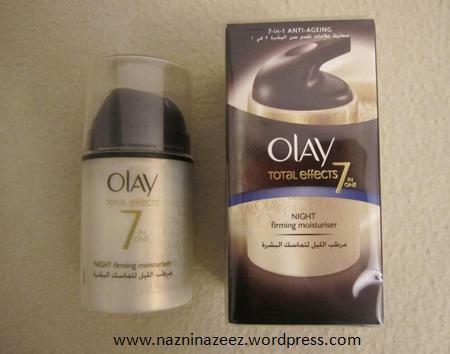 I use Olay Total Effects Night Firming Moisturizer. It costs AED 53.50 for a bottle containing 50ml. I like the soft smell of this one. The packaging is great since it has a pump. If you constantly care for your skin, I guarantee that you will love how your skin looks. It is ideal to complete your routine about 20 minutes before you hit the sack, since you want your face to absorb it all and not your pillowcase! …understand that your skin will not look the same as it’s now, ten years down the line [unless you have inherited amazing genes!]. You need to strive hard to keep your skin looking good. I believe skincare is much more important than makeup itself since the latter beautifies you temporarily but the former becomes the very foundation of beauty in your life. …it’s never too late to start one!. I got my mom started on a routine and chose products for her that’s suited to her matured skin and seriously, she has seen the results of following a consistent routine for about an year now. …invest in skin care products NOW. It doesn’t have to be high end!. Go according to your budget. There are plenty of brands to choose. If you are in your 20s, I highly recommend Olay Total Effects range. If you are in your 30s, I recommend the Olay Regenerist range (I will be changing over to this range once I hit 30.. Oh yeah, I plan ahead :P). I suggest you buy an offer pack like the one I mentioned in the beginning of this post or if you don’t want the face wash, go for one like the offer below. This was an offer I got in Carrefour couple of months ago. Though my current products will last me quite I while, I didn’t want to pass up on such a great deal. So it’s my back up now :P. Oh btw, it cost only AED59 for both products! …start with a basic CTM, which is Cleanse, Tone, Moisturize and stick to it for atleast 3 months. Do not expect to see immediate results or get disheartened seeing no results. Everyone’s skin reacts differently to different products. …slowly introduce more and more products into your routine, like from CTM go for CTSM (Adding serum to the mix) and so on. My daytime skincare routine – This one is much simpler than my night time routine. I will be mentioning my favorite scrub, masks and day time products in this post. Except for the toner, none of the products mentioned in my night time routine is repeated in the daytime toutine. Other skincare items I use – Any product that is not mentioned in my nighttime/daytime routine posts, will be mentioned in this post. If you found this post informative, kindly hit the share buttons below. It takes literally just 2 seconds. Also, comment and let me know what skincare routine do you follow. I would love to hear about it.